In order to promote the internationalization of cultural management in the framework of cultural exchange with renowned institutions, the Ministry of Culture of Spain has signed cooperation agreements with cultural centers, fairs and internationally important European festivals to fund a scholarship program aimed at young professionals internalizing Spanish cultural management. Óscar Falagán was awarded by Ministry of Culture of Spain to be part of this Program – Culturex Program -, designed for Spanish young professionals to work in cultural management in cultural institutions abroad. The destination selected by Óscar Falagán was the Locarno Film Festival. 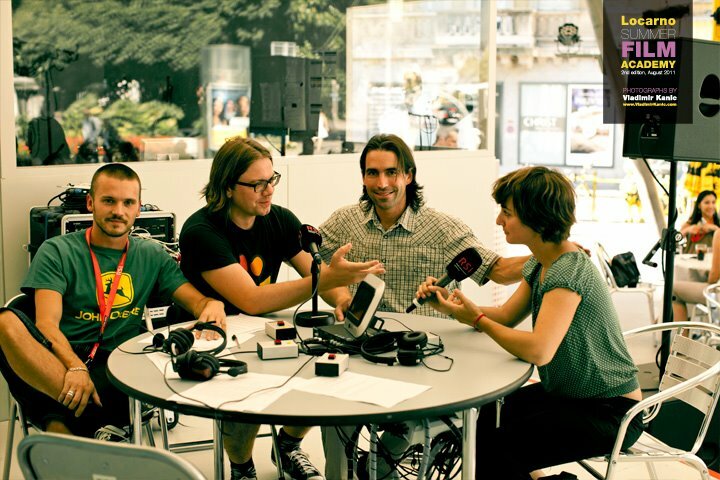 Óscar Falagán – the third on the right – during a live interview at Swiss Radio: conversation with young filmmakers of Locarno Summer Academy during the Locarno Film Festival 2011.